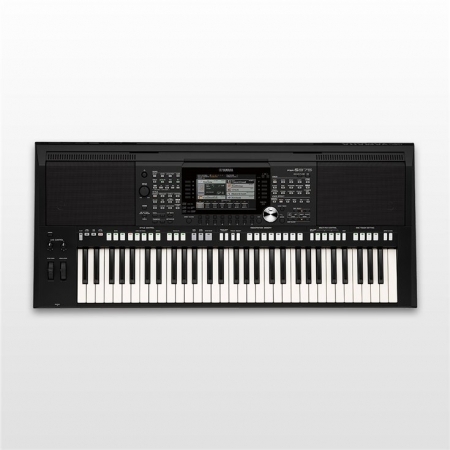 If you’re looking for the first piano for your child, the F-20 is the ideal choice. 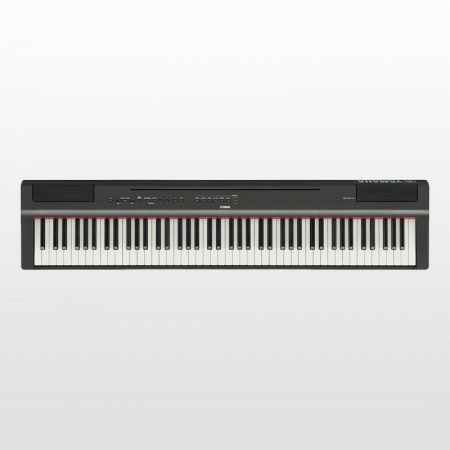 Delivering Roland’s acclaimed piano technologies at a breakthrough price, this compact and attractive instrument offers best-in-class performance that provides a solid foundation for learning the instrument the right way. Its rich, authentic tone inspires young players to explore and develop their musical expression, while the fine weighted keyboard action—derived from Roland’s flagship models—provides a true acoustic grand touch that’s essential for proper piano education. 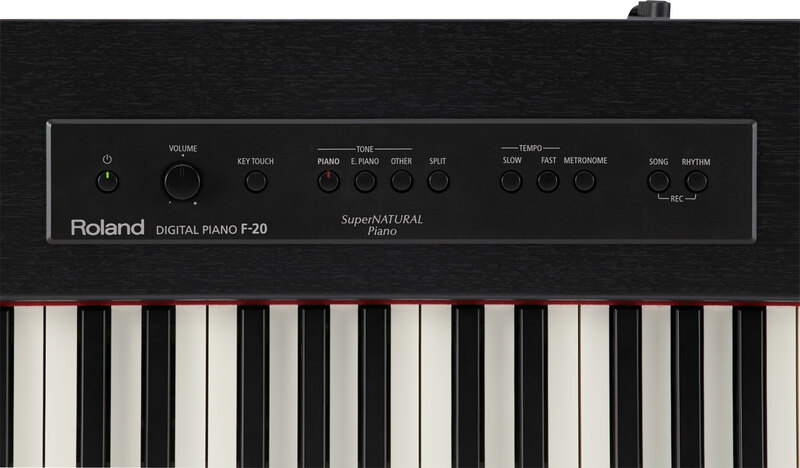 As a digital instrument, the F-20 presents many advantages over traditional acoustic pianos to encourage learning and make playing fun, including recording and metronome functions, onboard rhythm accompaniment, and a wide selection of sounds beyond the piano. 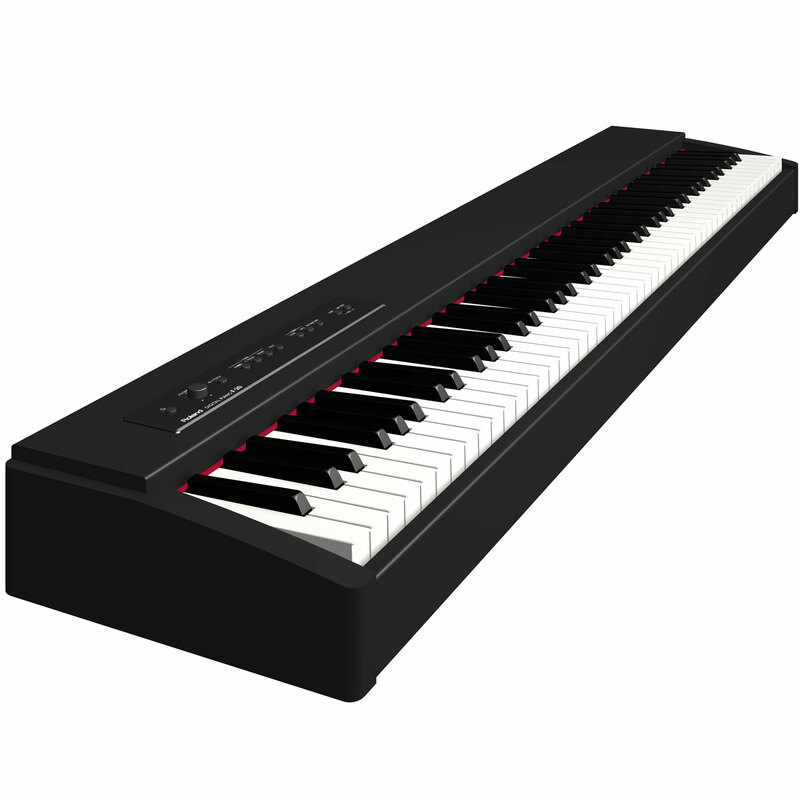 In addition, free Roland piano apps allow you to use your iPhone, iPad, or iPod touch with the F-20, providing a great way to motivate kids with play-along songs and enjoyable interactive features. 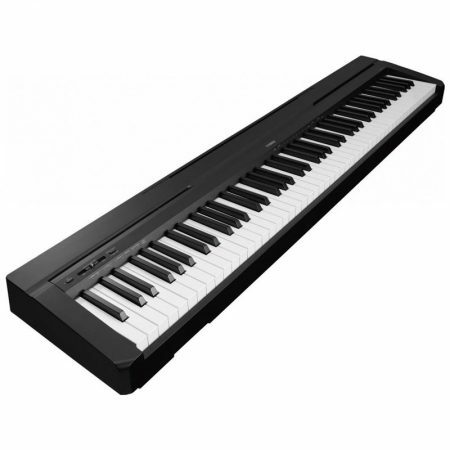 Though it comes at an entry-level price, the F-20 delivers sound, features, and performance directly inherited from Roland’s high-end pianos. With its compact size and built-in stereo speaker system, the instrument fits nicely into any home environment and is easy to move from room to room. The stylish wood cabinet comes in your choice of Contemporary Black or Simulated Dark Walnut finishes, so you can select the perfect color to compliment your living space. Offering quality sound and playing touch that far exceeds other instruments in its class, the F-20 delivers solid performance that will carry your child through many years of musical development. The Ivory Feel-G Keyboard with Escapement inherits the functions, appearance, and texture of keyboards found in our flagship instruments, providing an authentic grand piano touch for building fundamental playing techniques quickly and efficiently. 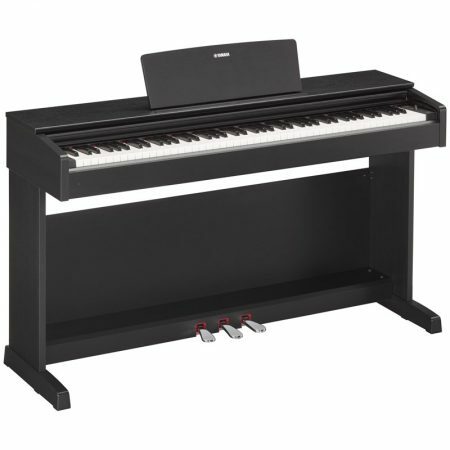 The famous SuperNATURAL Piano sound engine—also derived from Roland’s top-line models—allows students to develop their skills with the rich tone and expressiveness of a world-class acoustic grand. Roland’s free apps for Apple iOS devices offer a unique way to motivate your child’s interest in playing and practice. With the Air Performer app, they can play along with favorite songs in the iPhone, iPad, or iPod touch wirelessly* through the F-20’s sound system. The Piano Partner app for iPad includes Flash Card, an interactive music program that kids will love, plus an intuitive graphical interface for selecting tones, songs, and rhythms in the F-20. Flash Card develops listening and reading skills in a fun way by challenging your child to identify notes that are shown on the iPad’s display and sounded from the piano, with awards given after five challenges. Available from the Apple App Store, these powerful apps make it easy to use today’s mobile technology to enhance your child’s piano development. *Wireless communication requires the Wireless USB Adaptor (Roland WNA1100-RL or ONKYO UWF-1) and a wireless LAN access point with an Internet connection. With its onboard Rhythm feature, the F-20 lets your child experience music with a beautiful backing ensemble, so they can have fun and develop their timing skills at the same time. 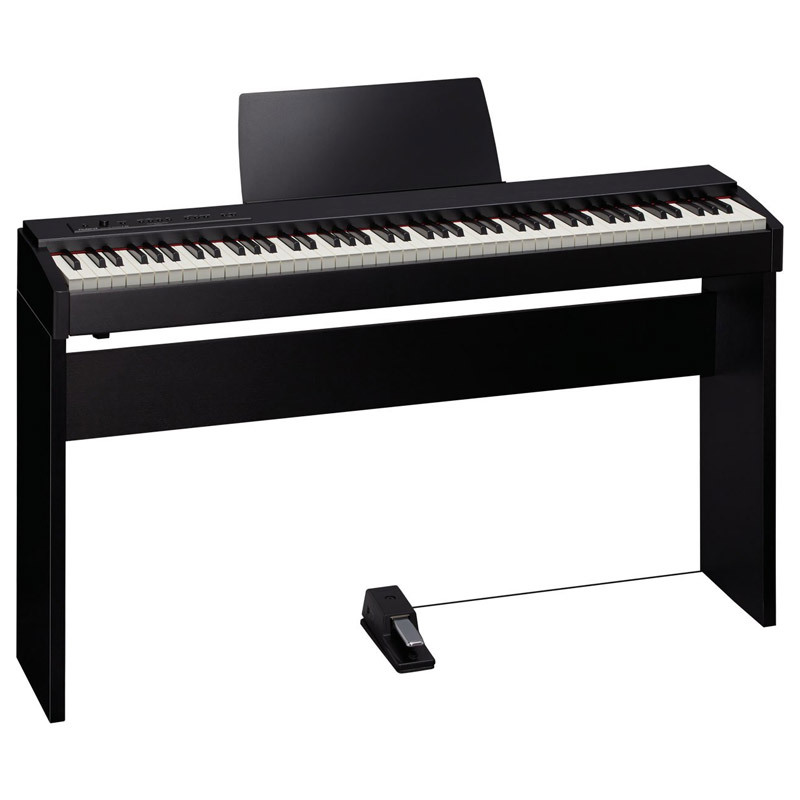 This amazing piano automatically accompanies their playing, intelligently following with chord backing and rhythms. 32 different accompaniment styles cover a variety of musical genres, and it’s simple and intuitive to select rhythms from the F-20’s panel or the Piano Partner app. The app also allows young students to play the fundamental elements of the F-20’s accompaniment (drums and bass or drums only) without the other backing instruments, a great feature for daily piano practice.